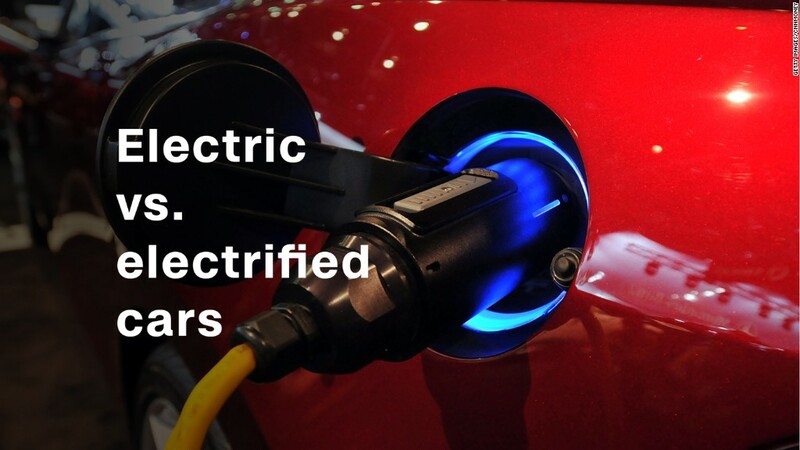 What's the difference between electric and electrified cars? General Motors will start selling a tiny electric car in China this week that will cost about $5,300 after national and local electric vehicle incentives, according to GM. For that sort of price, the Baojun E100 is no Cadillac, of course. The two-seat car's wheelbase -- the distance from the center of the front wheels to the center of the rear wheels -- is just 63 inches. That's about 10 inches shorter than Daimler's (DDAIF) Smart ForTwo, a car that is already remarkable for its stubby proportions. Prices for the car start at RMB 93,900, or about $14,000, before incentives. 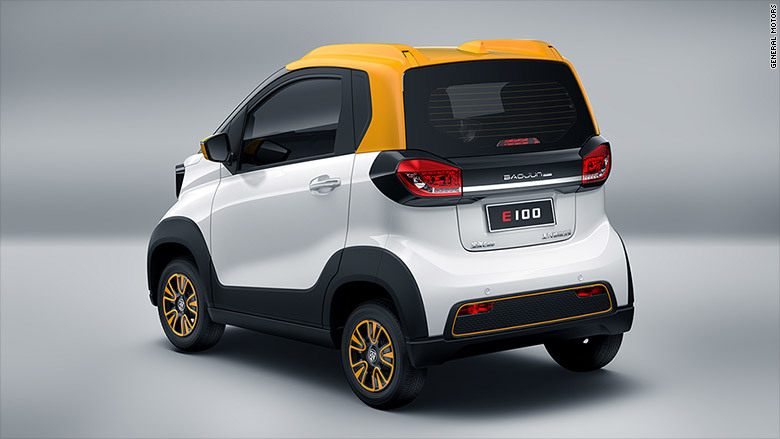 The E100, which is Baojun's first electric car, is powered by a single 39-horsepower electric motor and has a top speed of 62 miles an hour. The E100 can drive about 96 miles on a fully charged battery, according to GM (GM). The Baojun E100 has a top speed of 100 kilometers an hour, or 62 miles an hour. The E100 does offer some amenities, such as an entertainment system with a 7-inch screen and built-in WiFi. All versions of the car will have parking sensors and pedestrian alert systems among other safety features. High-end models are available with a touchpad and keyless entry. Baojun is a mass-market car brand from General Motors' SAIC-GM-Wuling joint venture in China. It's China's eighth most popular car brand, according to data from LMC Automotive, ranking below brands like Volkswagen, Toyota (TM), Honda (HMC) and Buick. 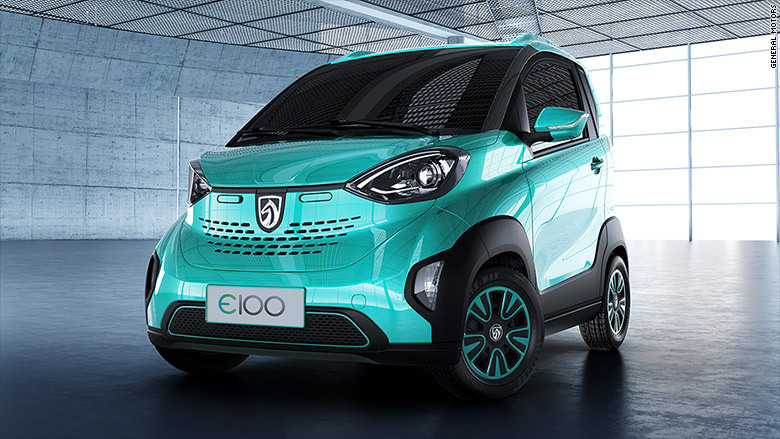 The Baojun E100 is even smaller than a Smart ForTwo. More than 5,000 people have already registered to buy the first 200 vehicles, according to GM. Another 500 vehicles will be made available this week, and buyers will be chosen on a first-come-first-served basis, a GM spokerson said. Sales will initially be limited to the Guanxi region of southern China, but GM plans to sell the car more widely in China. A GM spokesperson declined to say exactly how many it expects to sell. China is the largest automotive market in the world, and its government is making a big push for electric cars. Already, China accounts for 40% of all electric cars sold worldwide, according to the International Energy Agency.